I lovingly move it and my body moves me. I love myself; therefore, I provide for myself a comfortable home, one that fills all my needs and is a pleasure to be in. working with and for people that I love and that love me, and earning a good income. I watched as she hugged each of the hundreds of people who were there. She said she would stay until she had hugged everyone who wanted a hug. And she stayed true to her word. 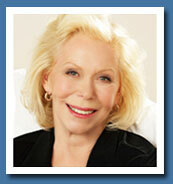 I invite you to visit Louise’s website. 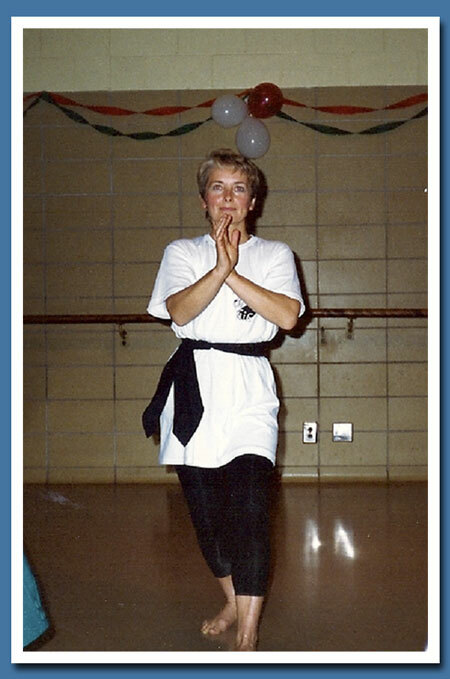 We met Dr. Sharon Bearpark and her husband Bob at our 1995 Maarnada Show. 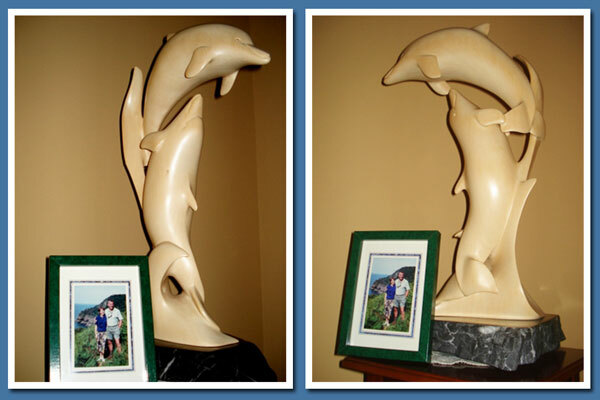 They purchased a beautiful bass wood dolphin sculpture called “Sweet Admiration” to mark their 10th wedding anniversary. Sharon had trained as a medical doctor and chose to use her gifts in the area of health promotion with a focus on children’s health and healthy schools. Sharon knew I was on the Board of Directors at Victoria Hospice and asked me about volunteering. I suggested that she wait until we moved into our new location, but she was compelled to volunteer earlier and went to the old site where she was welcomed into the current volunteer training program. 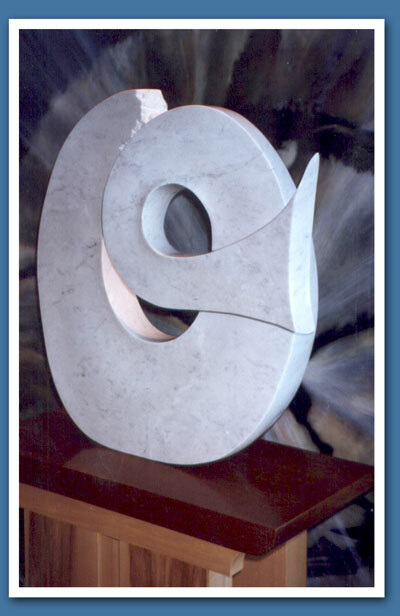 In the spring of 1996 I remember Sharon at the unveiling of Maarten’s sculpture ‘Courage’. As we are speaking of it, my vision eye freeze frames Sharon. 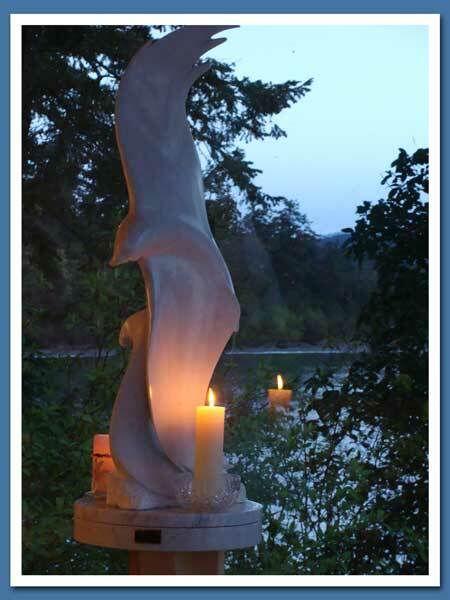 It is a picture that shows me that Sharon will be going through what the sculpture Courage represents. The outer circle represents an outward cycle of life. The break represents a traumatic change where life can't go on the way it was. The circle takes us inward into the Courage of the Heart where the inner healing work begins. We find our inner gifts and return to the world again to share. In the August of 1996 after excruciating pain while out on a run together, Bob is stopped in his tracks with serious back pain. A few short weeks later Bob is diagnosed with lung cancer that has spread to his spine and results in paralysis from his chest level. A brutal 8 weeks unfolds where Sharon and Bob together see the medical profession from the inside out. 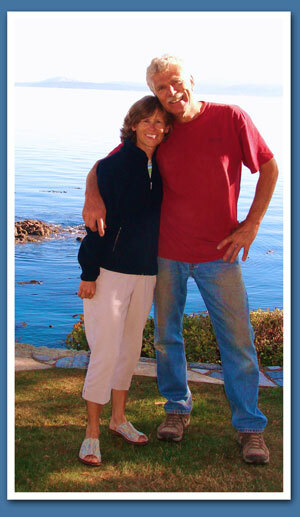 After weeks of medical treatment Bob is no longer able to wage a fight against the cancer that paralyzes him. Sharon has Bob moved to the same Hospice where she had been volunteering. Sharon and Bob companion each other and she is by his side when Bob dies on the morning of Monday, November 18th 1996. 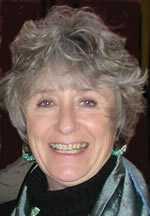 Sharon and I have shared her journey and in February 2004 Maarten and I host her book launch at Maarnada. 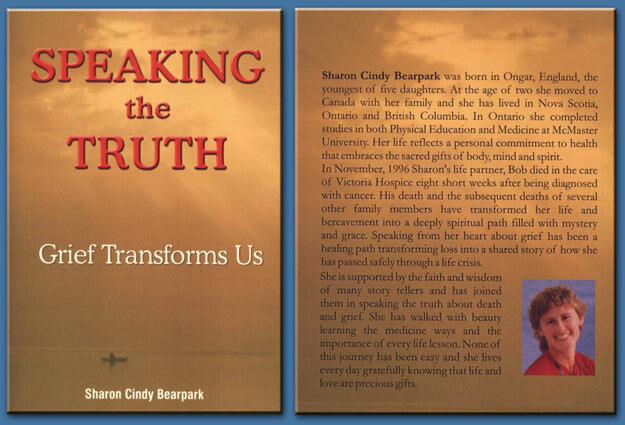 ‘Speaking the Truth - Grief Transforms Us” was inspired by her very personal journey and the years of daily writing she had begun when reading The Artist’s Way. The very same month Sharon becomes a Medical Advocate for Maarten and I as we go through my own journey and diagnosis that would require severe brain and cervical spine surgery. Sharon is a gifted intuitive and gave me the book inspired by a dream that Elizabeth Blackburn had had. 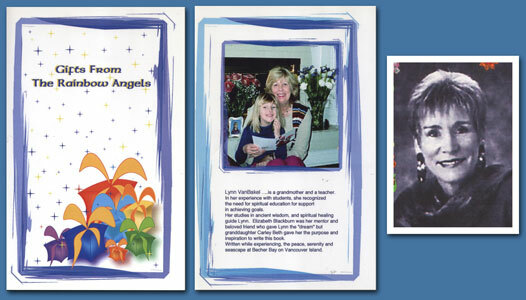 “Gifts From the Rainbow Angels” is written and illustrated by Lynn VanBakel a friend of both Elizabeth and Sharon. ‘Gifts From the Rainbow Angels’ accompanied us to Vancouver where I had my surgery and it was the book that I requested my friends to read to me when they came to visit. Thank-you to Rhona and Caroline! P.S. 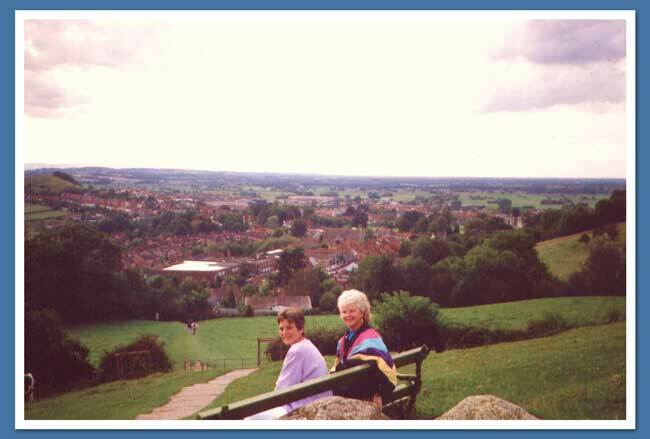 It was during my own journey that I had chosen in my heart to have Sharon walk with Maarten should I not return home. When I told them, they both rolled their eyes at me and they are still laughing today. I just wanted to put my life in order. Sharon and I continue to companion each other and our relationship grows from the depths of our hearts to the heights and balance of our well being. We are Medicine Women on a shared path. In 2001 after a 5 year hiatus Sharon had begun to pursue her love of running once again. I believe the confidence and determination she gained helped her to embark on her ‘Round the World Odyssey’. 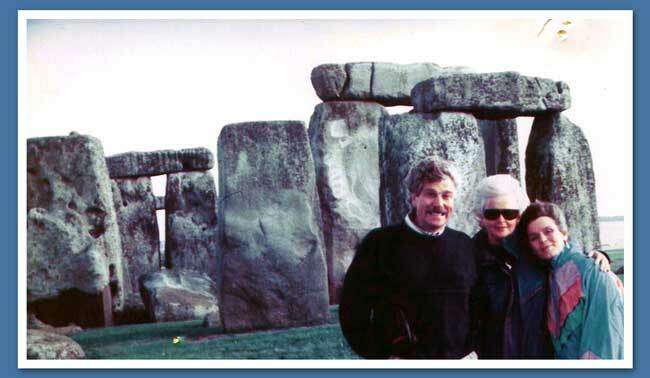 Beginning in November 2006 exactly 10 years from Bob’s passing, her journey of nearly 100,000 kms taken through 17 countries and over nine months allowed her to see firsthand the magnificence of this world and to honour the year she would turn 50. I asked Sharon if I could share her DVD of some of the highlights that remained with her from her ‘trip of a lifetime’. Sharon is small in stature like the pocket battle ship that her father in law had nicknamed her with, and with her courageous compassionate heart I welcome you to the gift of walking with Sharon. I invite you to visit Laura's site. After a meditation on my Grandmothers who have been the forgotten ones, I received pictures from both sides of my family of my Grandmothers and Great Grandmothers. I created a shrine for Mother's Day and sat with my journal in hand staring at them. Out loud I said, "I'm sorry I don't know your stories." "Do not concern yourself about our stories, we evolve through you, take us with you." 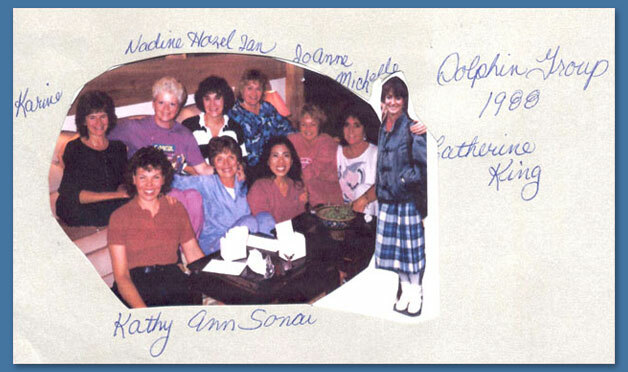 Soon after, I was invited to a workshop about Grandmothers that was being given by Laura Kealoha Yardley PhD. 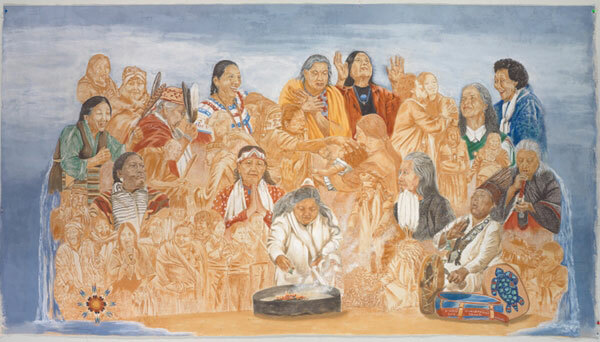 who wrote the 'Heart of the Huna'. 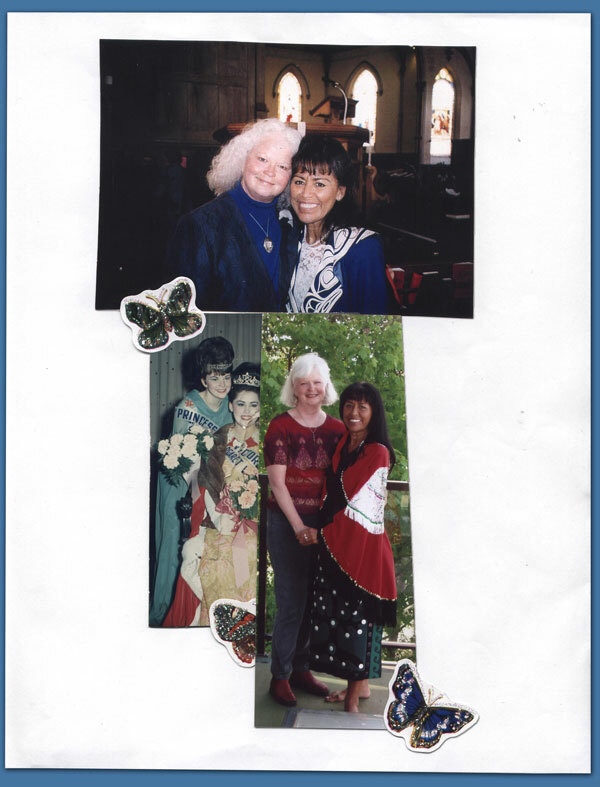 I became inspired by Laura's gentleness connected through her Hawaiian Grandmother. Laura introduced me to the Ancient Lemurian Goddess Uli. Uli connected me to the divine feminine energy of my emotions and intuition, the true source within me. Uli is the birther of self and gave birth to the living waters. As Maarnada is on the ocean, and the water element and sun element come together here and in Uli's story, she immediately came into my heart. 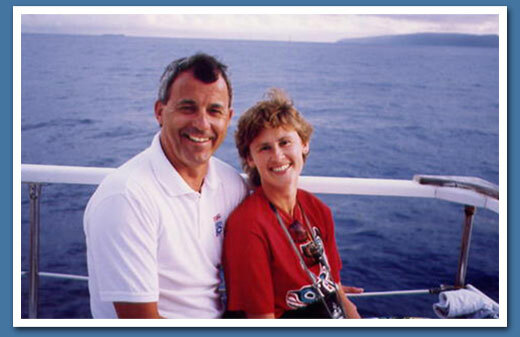 During the month of January we have vacationed in Hawaii for many years. In the early years with our children and Maarten's family. I asked Maarten to create a sculpture of Uli. 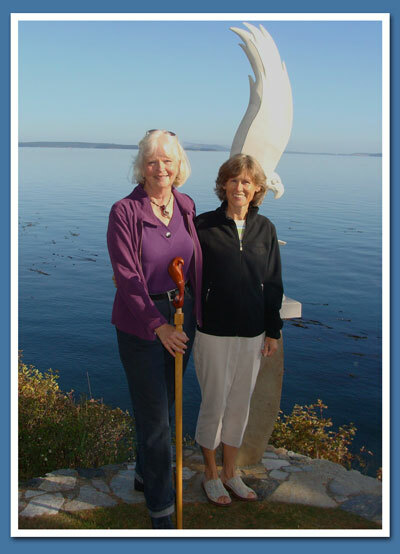 Laura blessed the stone of Revelstoke B.C. green marble. Maarten gave Maarnada's Uli to me for my 49th birthday September 1992. 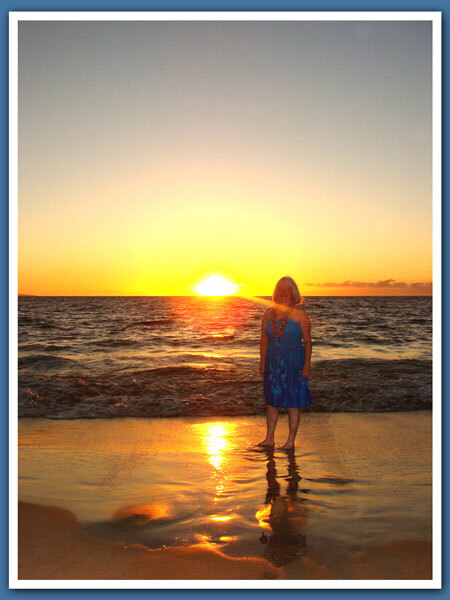 The picture of me floating in the ocean in Maui was taken by Maarten in January 2009. I had set myself in the path of the morning sun reflecting on the water and invited Uli to be with me. My web man Wizgym, Jim, created the feeling of being one with Uli. The picture taken by Maarten of me at sunset is the completion of the day when we said farewell to the sun using the Huna blessings taught to me by Laura. 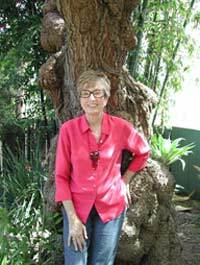 Aloha and Mahalo to Laura Kealoha Yardley. The most beautiful of beautiful mornings and from the distance I hear the Eagles calling. They don't rest for long, they are off to join their family on the rocks below Maarnada. There are five Eagles gathered sharing a feast. And there sits Grace, Mother of my friend Margaret Ruth Vickers. It is May 12th the day Grace Isabel Freeman was born and many years later the day Grace would die. 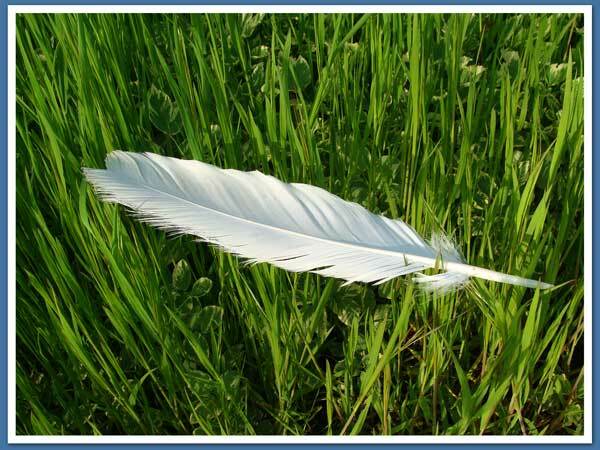 She plucks a large white feather from her tail and drops it down to me. Remember we speak through you"
Grace is a Spirit Mother to me. 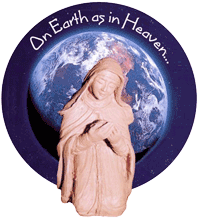 She sits in my heart on this day and I give grateful thanks to her. I met Grace's daughter Margaret in May 1967 when she would become Miss Victoria and I her first Princess. Over the years we have connected as friends and mentors. We have changed much over forty-two years. 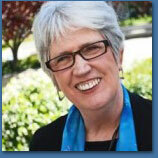 Margaret means Pearl - it begins with a small agitation and results in a treasure. Margaret is a hand of change in our world. 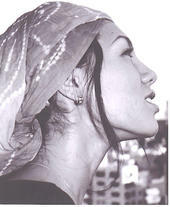 Link to Ehsida Bisset's website. I am dancing and singing on the Wind at the time of Ann’s Birthday sunrise. On a morning walk on our beach in 1989, an exquisite young girl child of twelve years of Earth age introduced herself to us. as if the Mother Ocean herself had brought her to meet us. MAASA walked along with us to the far point wanting to introduce us to her father Jon. Shook with the delight of a playmate that imagines and creates. We continue to play parts in our own real life Faery Tales. And they will be told in their own unique way. Where the whole of Creation rejoices in your presence. 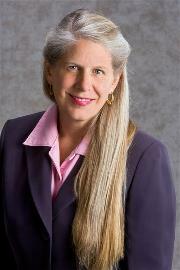 Dr. Jill Bolte Taylor is a Harvard-trained and published neuroanatomist who experienced a severe hemorrhage in the left hemisphere of her brain in 1996. 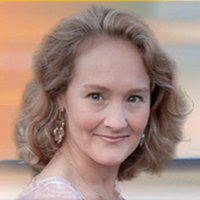 Peggy Black, is a ‘Sacred Sound Salutarist, Spiritual Synergist, Transducer and Scribe,’ author, world traveler, and lecturer with thirty-five years experience in the healing field. Subscribe to the 88 free messages, Nadina subscribed and loves them. 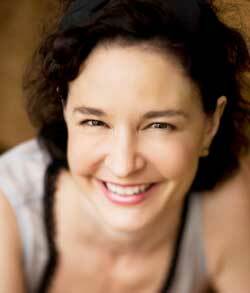 Sonia Choquette is a world-renowned author, storyteller, vibrational healer, and six sensory spiritual teacher in international demand for her guidance, wisdom, and capacity to heal the soul. 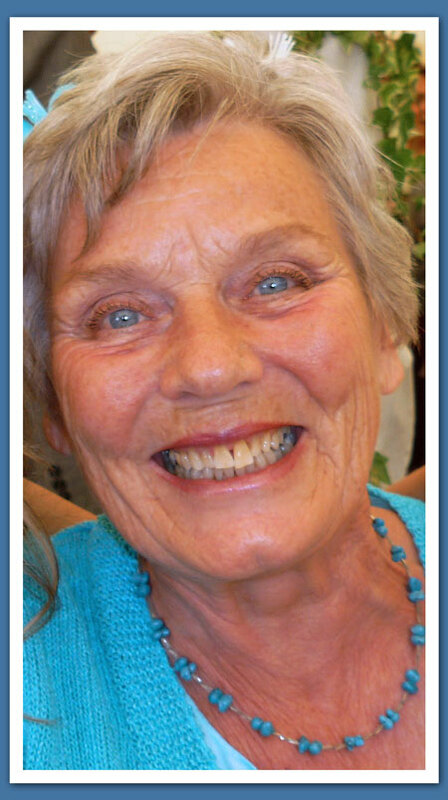 Click here to read her news letter. 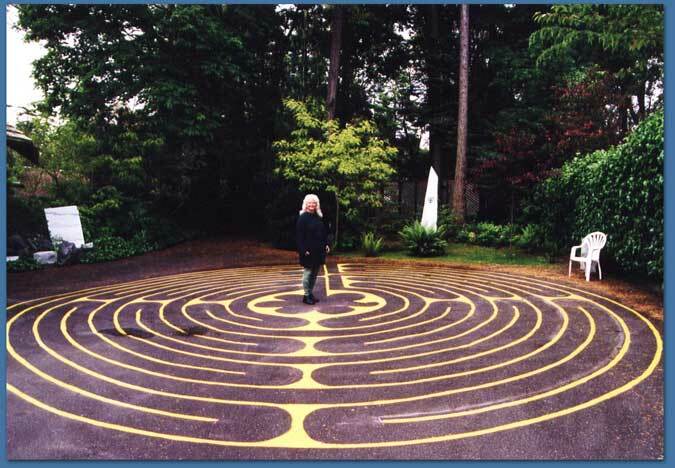 The Labyrinth is a wonderful tool as a walking meditation. It is solved through walking. 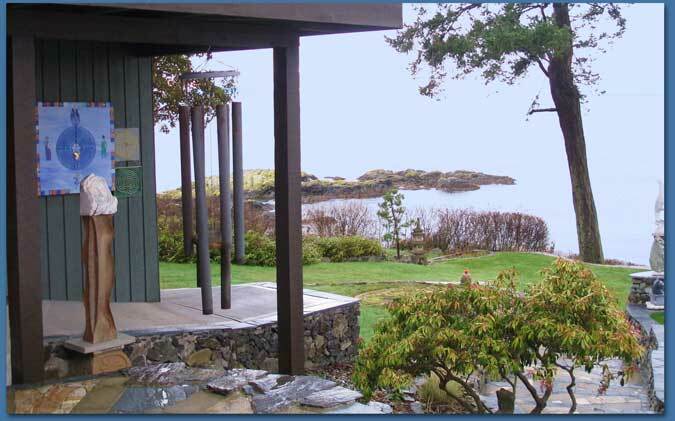 I was fortunate to train with Dr. Lauren Artress and received accreditation as a Labyrinth Facilitator in October 2000. 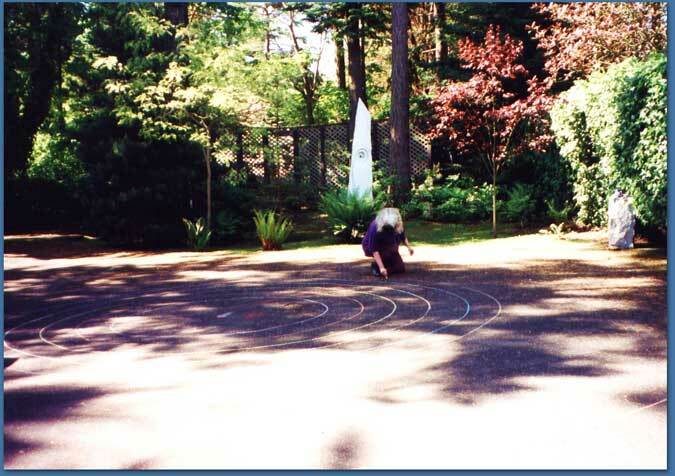 I taught courses and introduced the Labyrinth by working with people who saw the benefits of the Labyrinth. This included the canvas Labyrinth used at UVIC. Maarten and Troy assisted in painting our labyrinth that was on our driveway for ten years. Although our Labyrinth has been covered over my walking is facilitated by the many walks and the centre of the ‘Rose’ is on the waterside of Maarnada and my daily practice after welcoming the sun. 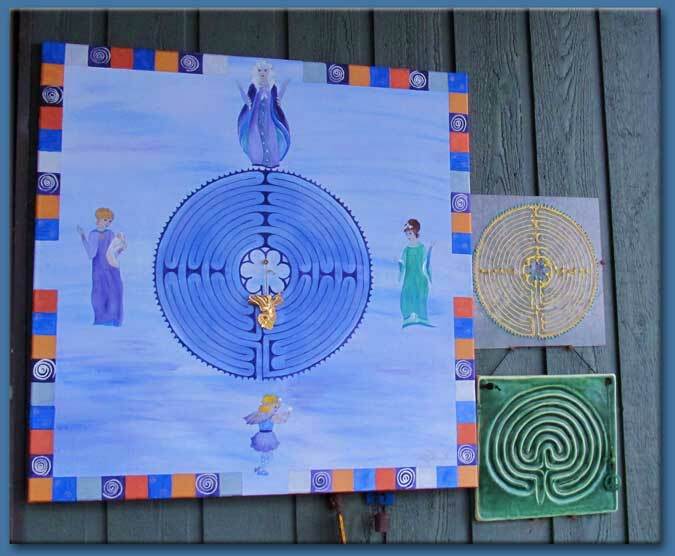 There are three finger Labyrinth’s that can be used to quiet the mind on the Path of Kindness that leads to the Rose. 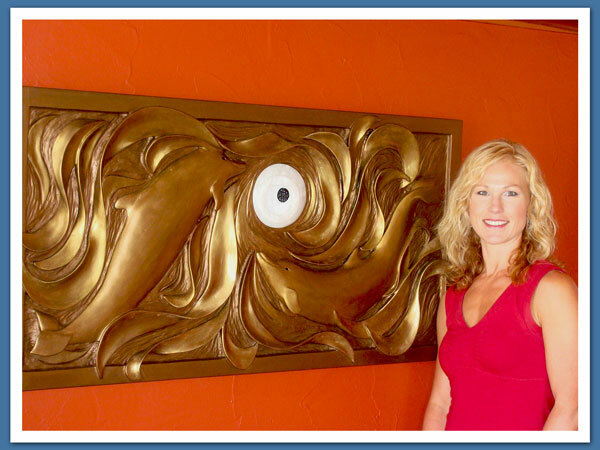 I invite you to visit Lauren's amazing website.